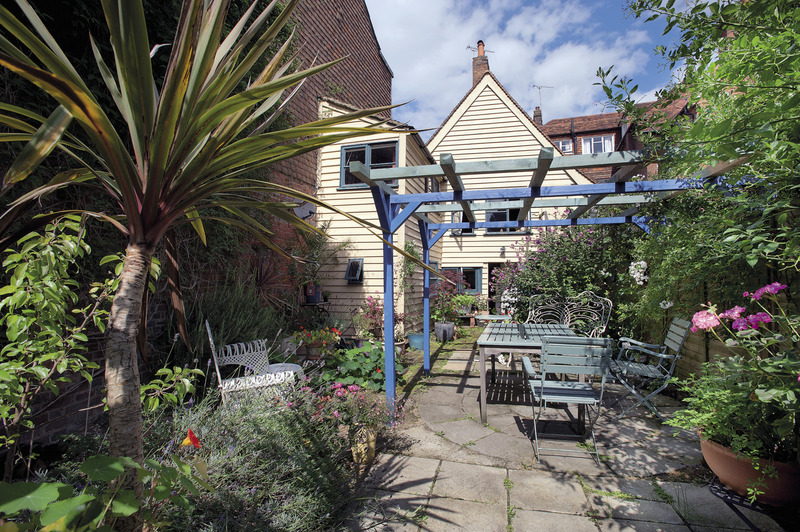 It’s a slightly odd feeling to be writing about a house that belongs to someone who is normally occupied with photographing other people’s. 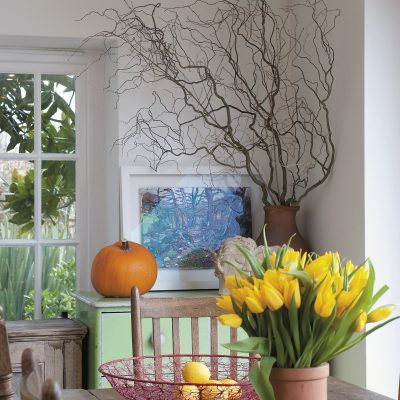 David Merewether is the Wealden Times’ photographer at large and the sort of man who quietly charms and reassures nervous homeowners when the WT team arrives with armfuls of flowers and bags of camera equipment to do a feature on their residence. He’s normally quite chatty, but today, it must be his turn to be feeling nervous because for the first few minutes of our meeting he hardly seems to draw breath as he fusses round finding chairs and places for our bags as he welcomes us, his very ordinary colleagues, to the house he shares with his wife Mary as if we are visiting dignitaries. Spotting an old album cover on a shelf featuring an orange tanned and bewigged Angus Deayton when he was in the “Hee Bee Gee Bees”, the 1980s spoof version of the Bee Gees, I ask David whether there’s a work connection. “Oh yes, I shot the pictures for that,” he grins. “It was before Angus Deayton was really well-known and it was great fun to do. The other two in the “band” were Michael Fenton Stevens, an actor, and the composer, Phillip Pope. They were three very funny, very talented guys. This enthusiasm is typical of David, who always seems one of life’s great optimists, and always talks cheerfully and animatedly about his work, whether it’s an unpaid job for charity or photography for advertising, books or magazines. The antithesis of the rather taciturn snappers such as David Bailey, this David has run his own business for many years and the way that he manages to combine quiet, calm efficiency with such a friendly, engaging manner is probably one of his greatest strengths. From the exterior, David and Mary’s house doesn’t give the visitor many clues as to what may be inside. It’s an attractive, but fairly modest weatherboard building with a delicately pretty Georgian oriel window on the first floor and another, more workaday Victorian one on the ground level that David uses to advertise his business. 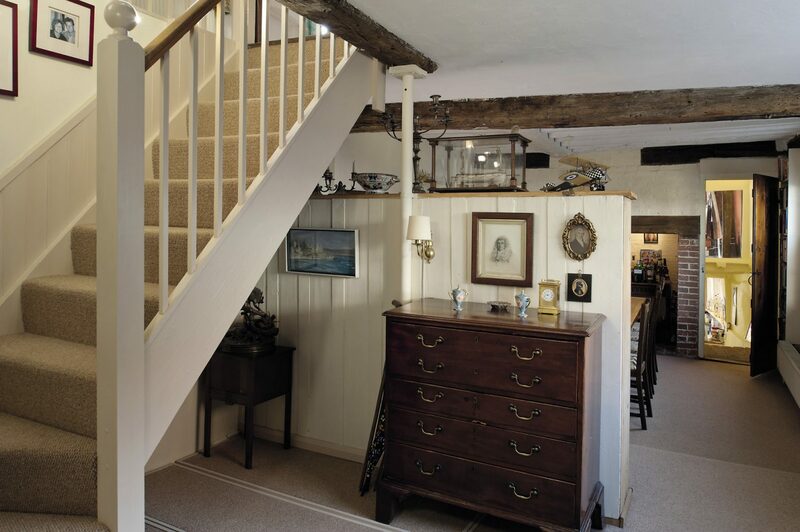 The first room that one enters is David’s office and is a fairly neutral space, with a desk, computer, and industrial sized printer, a couple of chairs, and a huge oak antique coffer that is so long it rather resembles a sarcophagus. “I found it on eBay and it’s fantastic for storing all my photographic equipment. It means that I can just put it away as I get home or take it out and pack up the car without fuss as I leave. 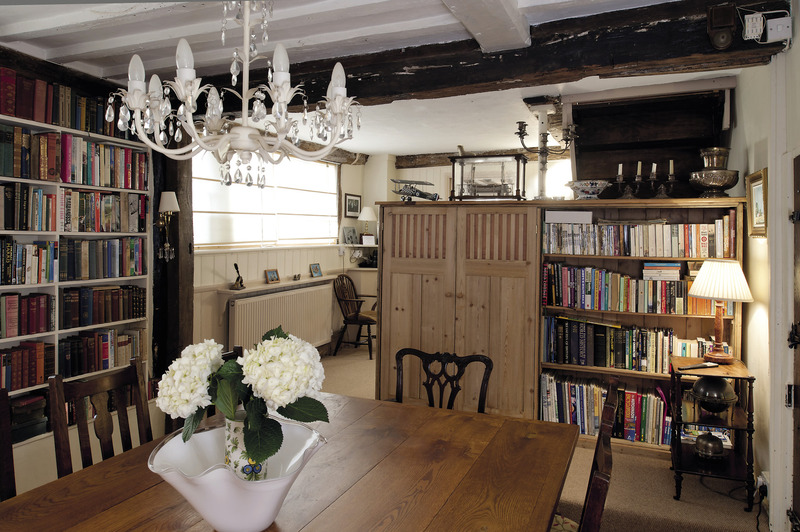 David has also built floor-to-ceiling bookshelves along the long wall of the room and the whole space has a feeling of simple, solid comfort. 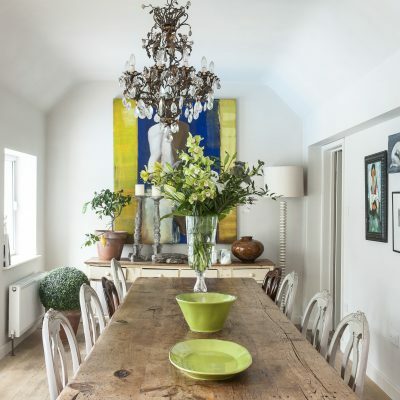 “We bought the reclaimed timbers for the table and took them to Jonathan Deacon and he made this really broad refectory-style table that is great for entertaining.” The table, surrounded by Edwardian oak chairs that were inherited from Mary’s family, is exceptionally generously proportioned and testifies to the couple’s love of large, sociable gatherings. 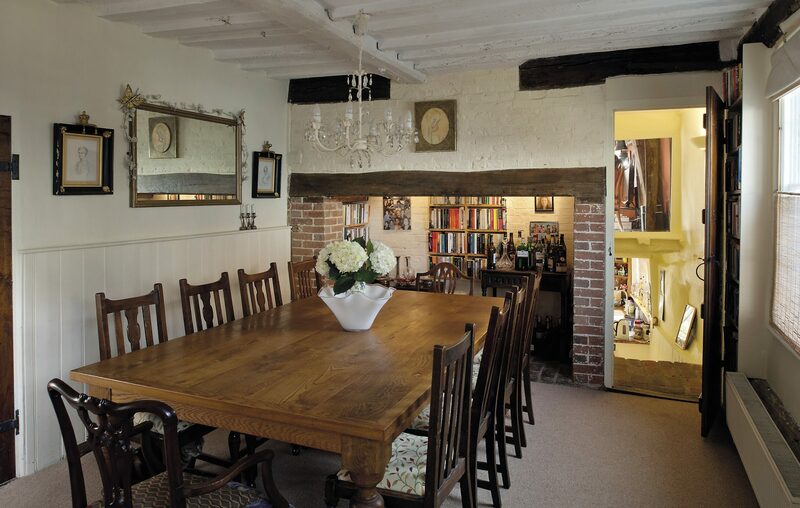 The brick inglenook fireplace is now used for the drinks table and for even more books. There are also shields and plaques from the ships and submarines that David’s father commanded. 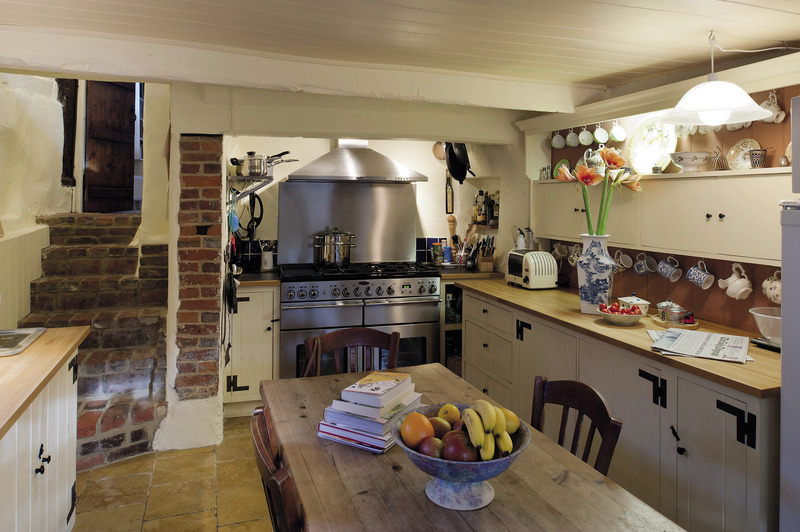 What was once a scullery, the kitchen has been updated with a huge stainless steel range, but has kept its old country charm, with a polished stone floor and scrubbed pine table in its centre surrounded by Provençal style chairs with delicately shaped wooden backs and rush seats. Buttermilk yellow wooden cupboards have been constructed to fit the slightly irregular old walls and a hand-built dresser displays some fine old china serving dishes. 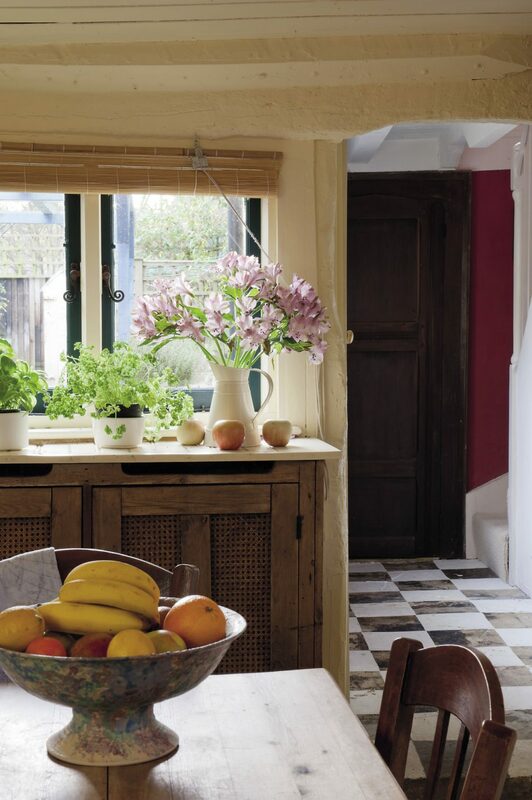 Blue tiles cover the wall above the butler’s sink and French faience ware and wooden egg safes line the windowledge. 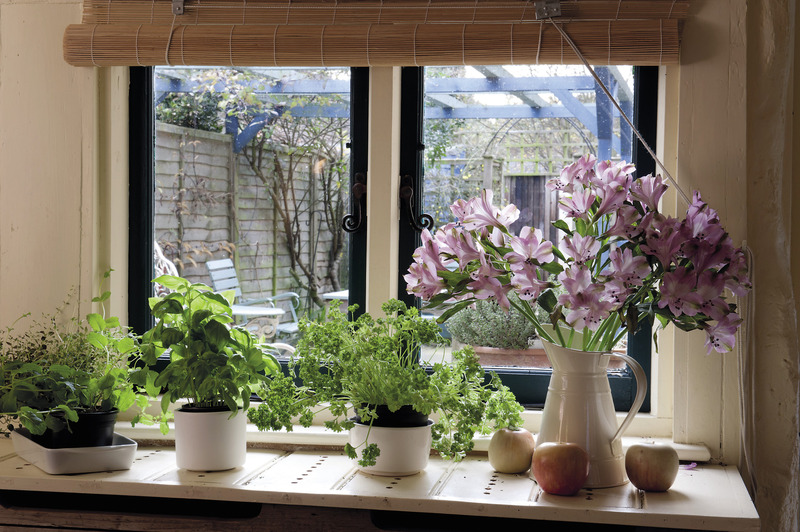 Another window looks out over the courtyard garden and the cupboard beneath it that David built supports pots of fragrant basil and coriander. The eye is then drawn beyond, to the chalky red walls of the rear hallway and floor, carefully painted to resemble black and white tiles. The scene looks rather like a Vermeer painting, where 17th century domestic life can be glimpsed through doorways and windows. 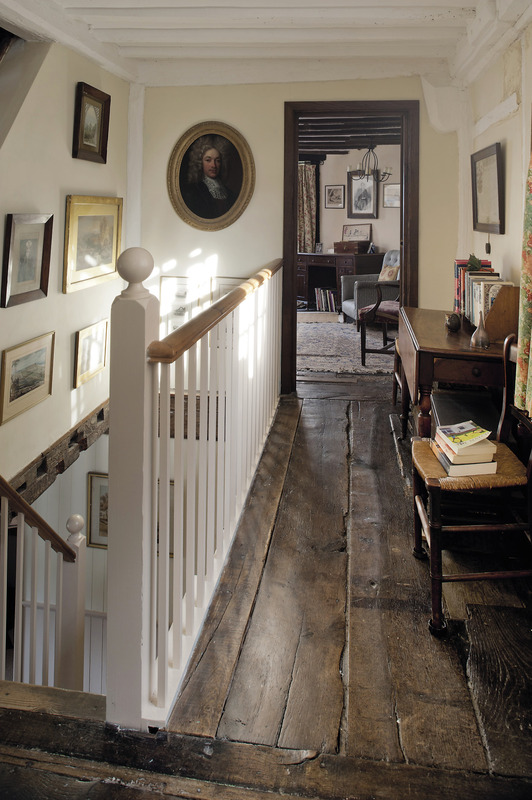 In one corner of the hall is the dainty staircase that Mary mentioned and it is a delight to find that it brings the visitor out into a kind of galleried library. 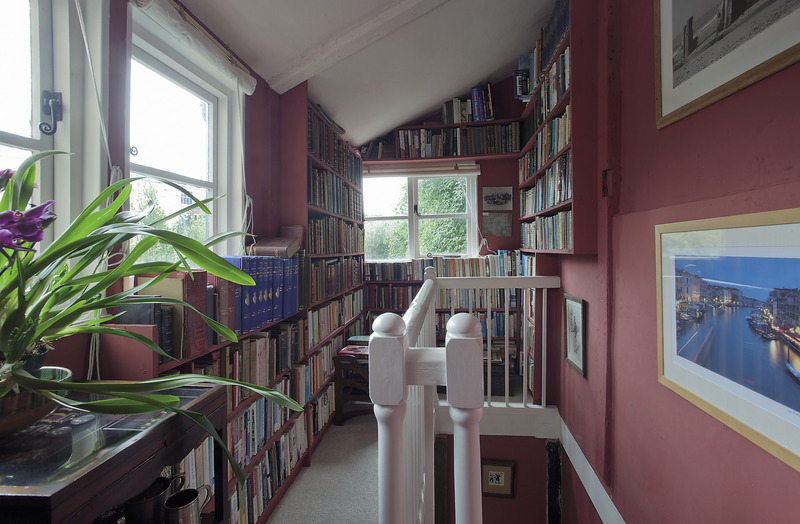 Again, David has constructed bookshelves that cover the walls from floor to ceiling. Many of them are old volumes inherited from previous generations of Merewethers who travelled the globe and then had their journals published in some style. The walls here have been painted in the same John Oliver “Rameses Red” that has the kind of matt, distemper-like finish that suits a building of this age. Beyond is the drawing room. 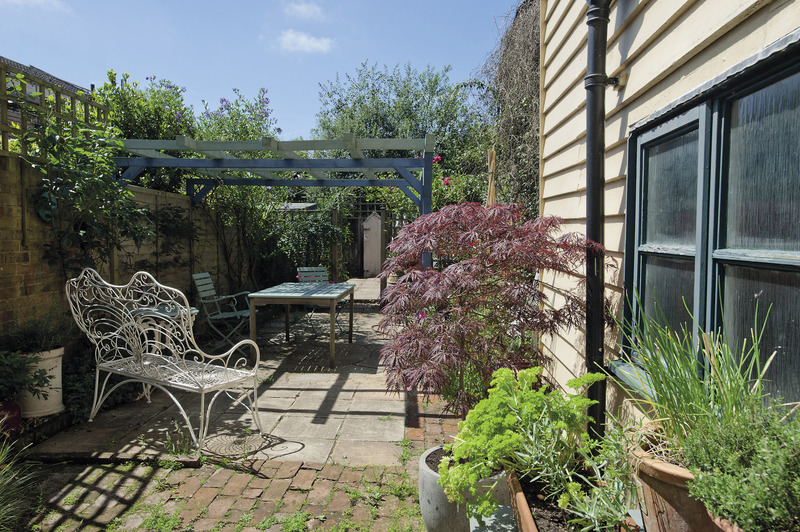 A generously proportioned space with a timbered, vaulted ceiling and row of windows overlooking the garden, this room has a door that leads out onto a wooden staircase built by Jonathan Deacon and fitted with a rope handle from Rye harbour to aid progress down to the garden. The floor slopes at a tipsy angle and the windows seem to jut out like the prow of a ship so that it feels rather like being in a grand captain’s cabin looking out to sea. 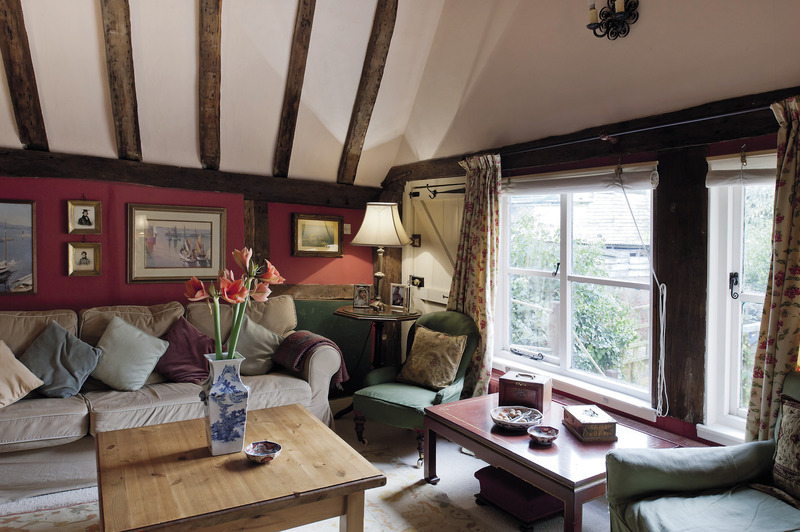 There are two plump sofas upholstered with plain and William Morris patterned linen with velvet and silk cushions scattered over them adding a sense of luxury. 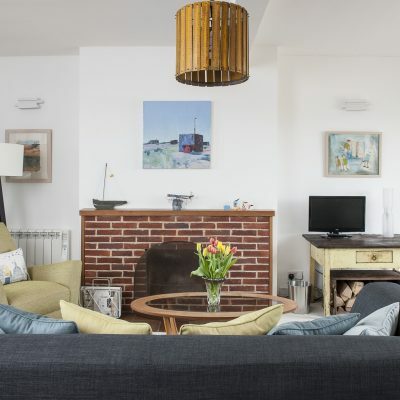 “We bought a modern coffee table because we knew that with this wonky floor we’d have to chop bits off the legs,” laughs Mary. “You don’t want your gin and tonic sliding away from you when you put it down.” Opposite the window there is the opening for a large fireplace that can sadly no longer be used. Across it, Mary and David have hung a canvas poster by Charles “Chas” Pears, a prolific maritime artist who worked as an Official War Artist during both world wars as well as producing posters for the London Underground and the Empire Marketing Board. This one was produced for the EMB in the early 1930s and features steamships sailing through the Suez Canal with Egyptian traders and their camels looking on. “It’s very much of its time,” adds Mary. “I like the colours that he’s used and the scene is quite familiar to me because my parents lived in Malaya when I was a child, so I sailed through the canal a number of times on my way back to England. 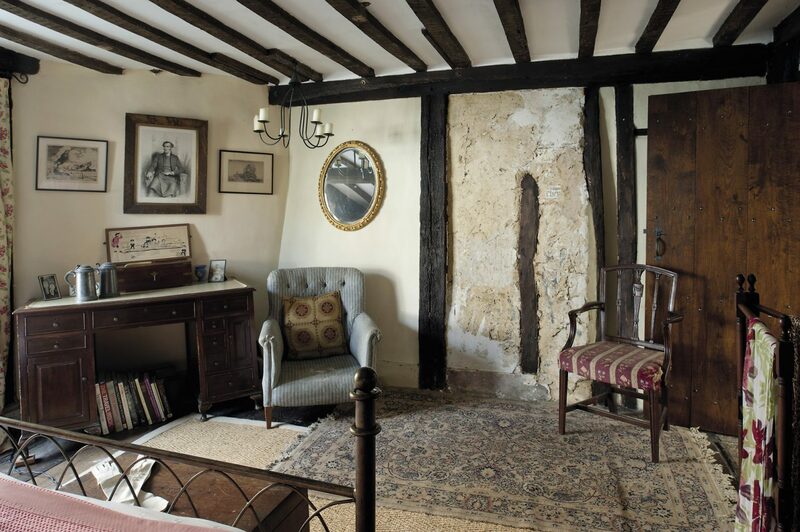 In the guestroom at the front of the house, part of the wallcovering has been scraped away to reveal a panel of pargeting and painting that must date from the 1480s when this house is believed to have been built. 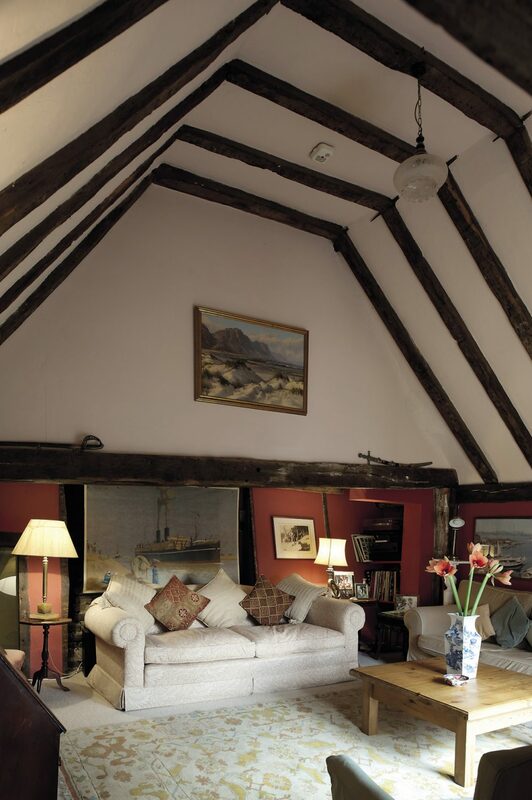 It seems strange to think that the rough wattle and daub still holding the wall together was decorated by someone whose sovereign would have been either the Machiavellian Richard III or Henry VII, founder of the Tudor dynasty. The floorboards here are almost two feet wide and career off at a comically steep angle towards the oriel window. 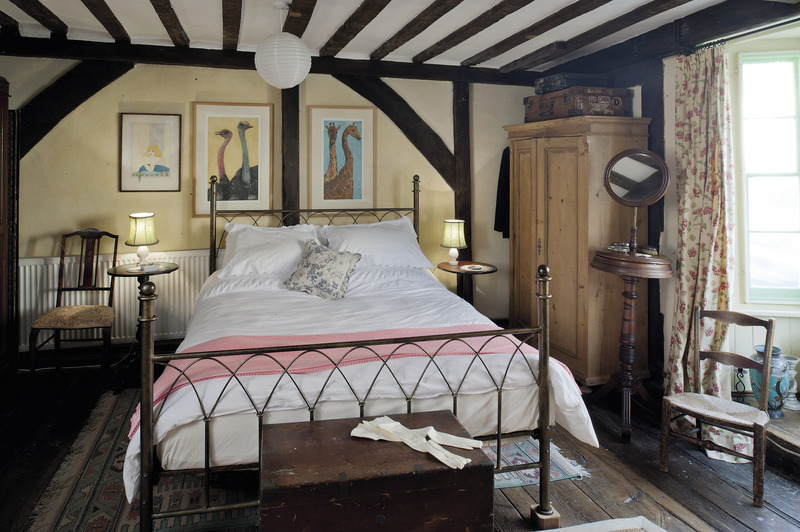 On the wall above the gothic style iron bed there are two paintings of an ostrich and giraffe by Tor Hildyard. A Georgian mahogany linen press and a yew-inlaid Victorian wardrobe hold more treasures collected abroad such as a bolt of intricately woven paisley fabric brought back from 19th century India. Above the dressing table, a serious-looking Merewether, John, Dean of Hereford Cathedral has been drawn in his Victorian prime in 1848. 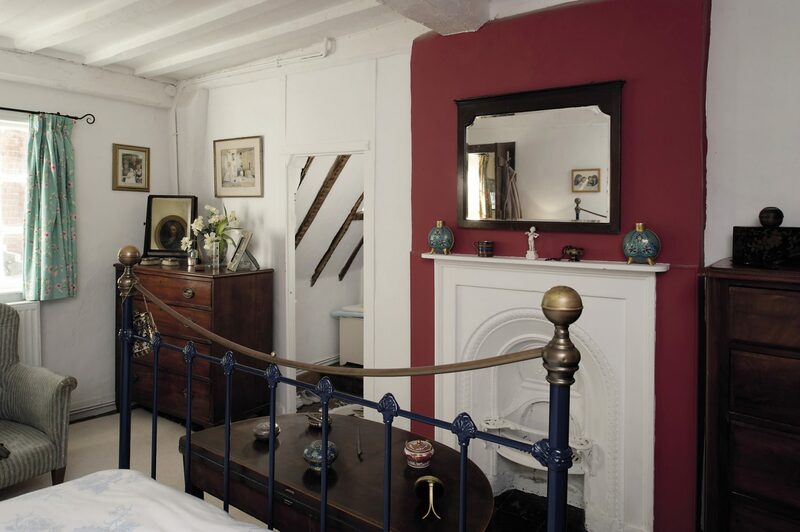 The main bedroom at the back of the house, is painted a soft chalky white and Fortnum’s green linen curtains are printed with a cheery pink and white almond blossom design. “David’s not keen on them I’m afraid,” adds Mary, “but everything else in here is so neutral, I like to wake up to a splash of colour.” There are two mahogany chests of drawers and another linen press. At the end of the bed a dainty Regency card table folded into a demi-lune holds a collection of Victorian dressing accessories. 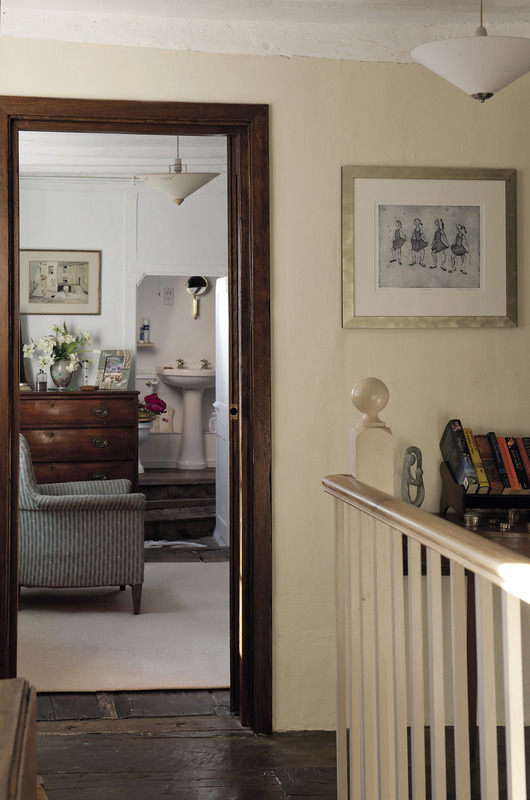 Through a low doorway, there is a bathroom whose walls bulge in such eccentric fashion that they almost seem as if the house has taken in a large breath. The top floor of the house is in the process of accommodating yet another new generation. 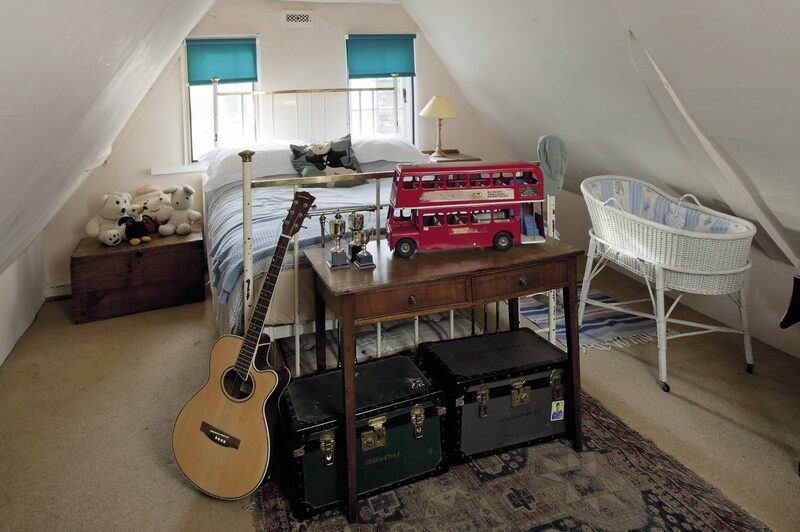 Previously the bedrooms of the couple’s twin boys and two daughters, the single beds in one have been replaced with Uncle Hugh’s double, and the family bassinet has been given a new coat of paint and fresh linen to welcome the Merewether grandchildren. There are tuck boxes under a table, a handknitted and obviously much loved Humpty-Dumpty on the blanket chest, and a large model red Routemaster bus, that David spotted being carried along for sale recently and couldn’t resist. This house that over the centuries must have seen so many new children arrive under its roof is ready to welcome the next ones.